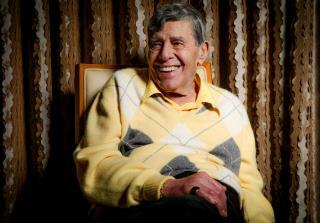 (Newser) – Legendary character actor and physical comedian Jerry Lewis has died at 91 in his Las Vegas home, the Washington Post reports. Described as a "defining figure of American entertainment" by the New York Times, Lewis broke onto the scene at age 20 performing with Dean Martin in the hit comedy duo Lewis and Martin. Along with achieving television, radio, and nightclub stardom, the odd-couple pair made 16 films together before bitterly breaking up in 1956. Lewis went on to write, direct, and produce his own work in a flourishing solo career that paved the way for comedic writer-directors like Mel Brooks and Woody Allen; his high-pitched, over-the-top antics playing “the Idiot” has also been said to lay the groundwork for comedians like Adam Sandler and Jim Carrey. One of the last of the greats. I wasn't fond of the routines and movies where he was just an overgrown child, but I did enjoy other movies he made, and most especially enjoyed the times he filled in on the Tonight Show after Paar left and before Johnny Carson could start due to contractual obligations with a competing channel. He was a GREAT host, and put on an excellent show every night. I still remember it, all these decades later.